My baby has grown up, as so many of us mothers say. Presley was tired of her little chair we had her in ( the ones you hook to the table) and her little legs were definitely getting to big, so we started putting her up in a big chair. she loves it. 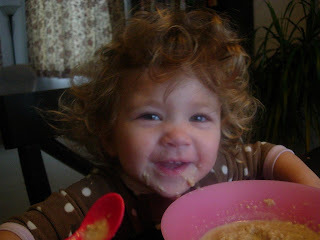 From the time Presley was eating solids, unless she gets to feed herself, she doesn't eat. Still that way. 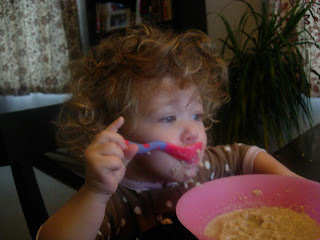 She definitely makes a mess, but what 18 month old doesn't right? 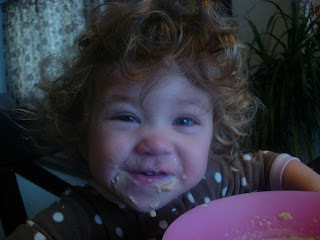 Oatmeal is her thing right now, and just my favorite thing to clean up. I can't stand that maple syrup smell that just seems to linger around everytime we have pancakes, and the maple oatmeal is just the same. 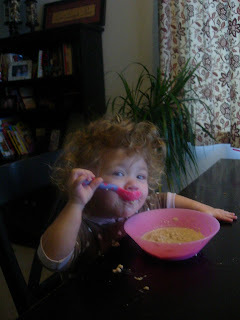 Most of the time she gets a bath immediately following breakfast because the amount that ends up on her clothes, hair, and pj's opposed to her belly is phenomenal. But hey, she can't help that she has big hair, so that one is to be expected. Sometimes I wonder if she actually got full, but she seems to thrive al right, so I guess we're good. I hate that after I clean up the oatmeal it's stuck to the clothes, like I try and wash out the bib and it won't come off! Annoying, bit WAY CUTE PRESLEY!!! Bea loves the big chair too. She refuses to sit in her high chair. She is so demanding about it too. funny girls.